One of the goals of the GNU Project is to build decentralized, free software Web platforms that are harder to surveill. Photo CC BY SA 2.0 greenoid. Mass-scale surveillance like PRISM is disturbing, but is an unsurprising effect of how centralized the Web is today. For years, people have been trusting more and more of their data to remotely hosted systems. Users are also giving up control of their computing to Service as a Software Substitute (SaaSS), remotely-hosted programs that exchange data with users to do computing that they could do on their own machines. In both cases, there's no way to see what these servers are doing with your data, so you have to take the host's word for it that they are being responsible. But these companies submit to governments when they ask for your information, whether it's ostensibly to fight terrorism or to stop unauthorized copying. If we want to defang surveillance programs like PRISM, we need to stop using centralized systems and come together to build an Internet that's decentralized, trustworthy, and free "as in freedom." The good news is that the seeds of such a network are already out there; as we wrote in our statement on PRISM, ethical developers have been working for years on free software social media, communication, publishing, and more. Being decentralized means that these programs don't concentrate everyone's data into a honeypot to attract snooping corporations and governments. Being free software means that it's harder for them to keep secrets from users, and that anyone can modify them to remove features they aren't comfortable with. In fact, those interested in surveillance have been known to require people to use proprietary programs to make it easier to keep tabs on them. We have the tools to build a better Internet. All that's missing is for a large number of people to leave the systems and services that make us vulnerable and put their energy and passion to work. The more of us who get on board with safer platforms and modes of communication, the stronger we all become. Bring safe Web platforms to more people by setting up an instance of software designed for network services, such as GNU social, Pump.io, GNU MediaGoblin, or GNU FM. Contribute to the code base of a GNUnet or another free software project created with users' privacy in mind. Use encryption to code your electronic communication so that nobody but the intended recipients can read it. Get started at Email Self-Defense, the FSF's beginner guide to email encryption with free software. Encryt everything you can: if you only encrypt sensitive communication, those messages raise extra suspicion from surveillance programs. Don't use Service as a Software Substitute. Close your accounts with systems that can't be trusted with your data. Switch to free, safer replacements like the ones listed in the PRISM collection on the Free Software Directory and prism-break.org. Bring your friends with you! Demand accountability; Sign the StopWatching.us petition for a full congressional investigation of the NSA. 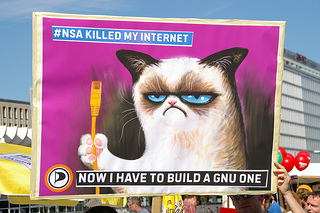 Donate to the teams working on free software systems that protect your privacy or to the FSF. Start using encryption to make your communication harder to snoop. GPG for email and OTR for instant messaging are great places to start. Hang our "Privacy is impossible without free software" poster in your home, workplace, or local hangout. Security expert Bruce Schneier on "Government secrets and the need for whistle-blowers"
Reform Corporate Surveillance: While major technology companies voice their support for legislative changes they think will address the problem, they continue to drive technology which is on face damaging to everyone's privacy, freedom, and security. FSF's response to Microsoft's privacy and encryption announcement: If the NSA revelations have taught us anything, it is that journalists, governments, schools, advocacy organizations, companies, and individuals, must be using operating systems whose code can be reviewed and modified without Microsoft or any other third party's blessing.